Rosemary is a fragrant evergreen perennial which is often kept in kitchens for its herbal qualities, as well as being grown for decorative holiday trees and bonsai trees. For these purposes, rosemary is most commonly grown in a pot. Native to the Mediterranean area, rosemary does best in warm sunny climates, but since its popularity has taken it all over the world, rosemary can now be found in colder climates. This is another reason rosemary is often kept in a pot--for easy transport outside in the spring and back indoors for the winter. The potted rosemary tree is a more fragrant rosemary but also a more temperamental rosemary tree. Determine if your rosemary tree is dying from being over watered. Check the pot your rosemary is in to determine if it has enough drainage. Similarly, check the soil your rosemary is in. If the soil is more clay and not enough sand and loam, this could contribute to your rosemary's roots having root rot due to too much moisture. Remedy an over watered rosemary plant by re-potting it into a well-draining soil mix within a pot with adequate drainage. Additionally, you can set the first pot within a larger, gravel filled pot. Water your rosemary with just a half of a cup every other day, and allow excess water to run out of the pot. Dispose of the excess water. Determine if your rosemary tree is being under watered by checking the soil. If the soil is dry throughout the pot, your rosemary is dying due to a lack of water. Begin watering your rosemary tree daily to ensure it is getting enough water. Pour a half of a cup of water into the soil at the base of the plant. Get into the habit of checking the soil of your rosemary. If the top layer of soil is dry, it is time to give your rosemary some water. Examine the location of your rosemary tree. Inadequate sunlight is a common cause of rosemary tree death. 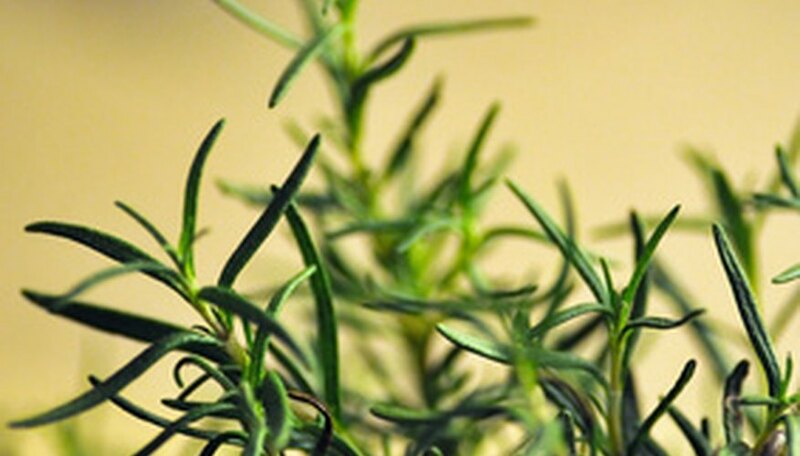 Rosemary needs full sun for at least six to eight hours a day to be healthy. Relocate your rosemary to a sunny location if it is dying due to inadequate sunlight. South facing windows allow for the most sun in an indoor location. If the weather is fair, move your rosemary outdoors for sunlight. If there is not enough sunlight available, supplement your rosemary's light with fluorescent lighting placed just 4 inches above your plant. Determine if your rosemary is dying due to harsh elements. Rosemary does not fair well in the winters of the cold climates. Rosemary can stay outdoors year round in zones 10 through 8, but will need some protection in other zones. Protect your rosemary tree in borderline zones by mulching it heavily or by bringing it inside. In the winters of the coldest zones, rosemary will have to be brought inside to survive the winter. Before bringing your rosemary indoors, wean it off of sunlight by gradually moving it to shadier spots to allow it to grow leaves which are better suited for less light. Check your rosemary tree for powdery mildew. This is a common ailment for rosemary and can be remedied by increasing the air flow around your rosemary with a fan. Check your rosemary tree for pests. A rosemary tree weakened by poor water or sun is more susceptible to infestation. Treat your rosemary with neem oil or some other organic insecticide to get rid of the pests. Your rosemary will need less water in the winter months. Do not use chemical pesticides or fungicides on your rosemary if you are using the leaves to season your cooking.